This was my final trip of the summer, and fittingly the season was fading just as my time there was. This week brought on the weather—thunderstorms, blustery winds, and cooler temperatures day and night. The frogs are showing the shift—an adult mountain yellow-legged frog sat on a rock in the stream very near where we saw her last week, but this time flattening herself, trying to warm up in the waning rays of late summer. The treefrogs have pretty much metamorphosed, as they do over the course of one full summer, and some were just finishing resorbing their tails. The chickadees, Clark’s nutcrackers, chipmunks, and pikas seemed busier—the shift in weather, day length, and strength of the sunlight signaling a call to gather all that is needed for winter. We, too, seemed to move more quickly, as the brisk pace kept us warmer and got us that much closer to a hot mug of tea and shelter from the winds after work. This week brought new challenges, in a form that I have not had to contend with much in the last couple of years. This is one of the biggest conservation conundrums—not everyone feels the same way about ecosystem health and restoration, and it is not easy to communicate biological principles to someone who sees wildlife being managed in a way that they don’t agree with. I refuse to believe that it is a dichotomy that cannot be remedied, yet in the moments of the Clash of the Ideals, there is little to be done—the work must come much, much farther ahead of this, the result. Afterward, the unpleasantness of the situation left me staring at the granite peaks for solace—there they stand, where they have for millennia, and will for millennia from now, indifferent to human disagreements over frogs and fish, whether either—or neither—will be present then. Working on this project has taken me over and through many things I have learned during the course of my career—from backcountry living, travel, and survival skills to conservation biology and endangered species management principles. It unintentionally served as a simultaneous post-doctoral review session and wilderness retreat from all that demands my attention back where wifi and cell signals extend their reach. The past two months have flown by, and as I type this back at my computer, with its information and demands at the ready in its other windows, I miss the simplicity of the wilderness already. I experienced a new depth of understanding of reintroduction biology, and I couldn’t have hand-picked a better experience to shortly follow finishing my PhD. I will certainly be back, if only as a volunteer. 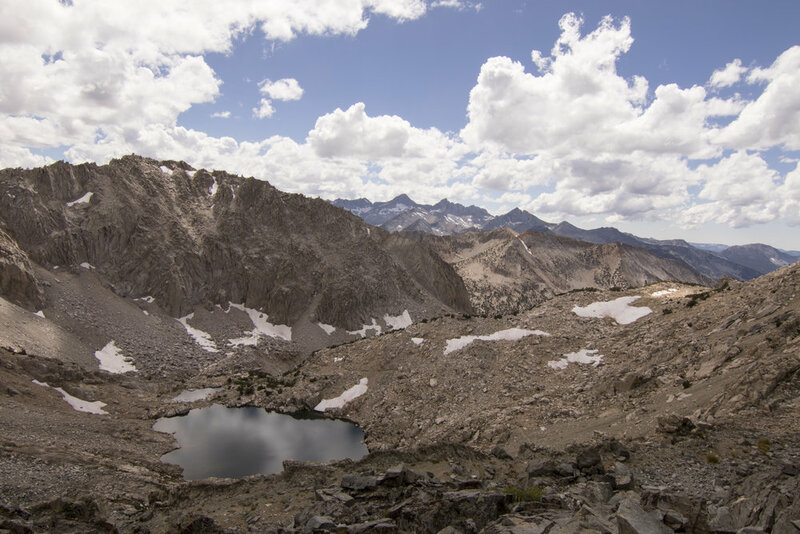 On my final hike out, and my 8th hike over Kearsarge Pass of the summer, I thanked the mountains for their beauty and for their mercy—for not killing me when they could have, and for giving me more than I could ever give in return.